New work on the drying rack. This is the latest work i am busy with. I am working on the finish i will get after firing,i am wanting the top of the crackle to sinter out just a bit so i can add what ever i want to the background body. Ceramic box on the drying rack. A flip top ceramic box. Here i made this box with a flip top , the hinge has a piece of plastic coated wire in it that i put in after glazing. Ceramic box. A low fire red clay. 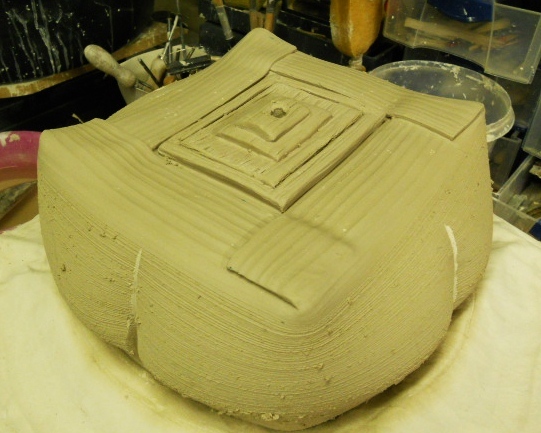 A twist on Terra Sigillata .
. A slab built box. Here i first put a copper carb. wash ( in the deeper parts of the surface ) and terra sigillata on before bisc. After bisc. i put on a low fire red glaze that i wiped off just so that the terra gets some color and i get a hint of red to give the pot some life. The lower part has a darker terra on and just before glaze bake i sprayed a solution of iron chromate and a frited iron on to the work to get fine spotting on the surface and to accentuate the base line and handles. Copper carb. wash and terra. with a wiped off glaze. Using a slab roller to make a box form. Here i used a slab roller and rolled out a slab that i then wrapped this around a plastic box that itself was wrapped in newspaper so that the shape would come loose after it had dried a bit. When it had dried over night i first worked the top in being able to work from the inside and then left it upside down for a about four hours to harden up then i placed it on a flat slab and folded the edges around to form the base. I later added the stamps and lid. Check out the menu bar and you will find the page for , How to make a ceramic box, this will show how i make these boxes. Box made using slab roller. to this form. I will give this a go with the next attempt.